Clicking the "Custom Installation" button on the welcome screen, allows the user to choose which components will be installed. The developer of the setup package can indicate requirement relationships between components; that is: indicate that one component requires another. If component A requires component B, selecting A will automatically mark B for installation as well, while deselecting B will deselect A too. A description of what the selected component is for, can be seen below the component list. This allows for an educated decision instead of a blind guess on a short component name. 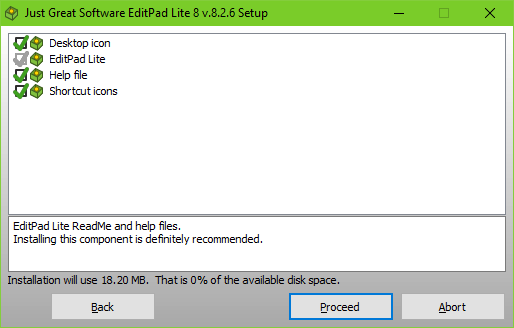 The impact on installation size is also immediately visible, both in absolute size and as a percentage of the available disk space. When the component selection is complete, the setup will continue as if the "Immediate Installation" button was clicked on the welcome screen. So next up is the license agreement.